In 1935, after being diagnosed with colon cancer, A.A. Noyes knew that he would soon have to step down from his position as Chairman of the Division of Chemistry and Chemical Engineering at the California Institute of Technology. As such, Noyes began planning how best to transition his administrative portfolio to whomever might be elevated as the next chairman. Noyes favored the idea of promoting a strong researcher – rather than an experienced administrator – into the position, and was likewise keen to continuing strengthening the divisions’s ties to the Rockefeller Foundation. With these criteria set, Noyes quickly settled on Linus Pauling as his favored successor. Pauling was aware of Noyes’ preferences and, as time moved forward, began to press the issue himself. When July arrived and little movement had been made toward appointing a new chair, Pauling approached Robert Millikan, professor of physics and Chairman of the Executive Council at Caltech, to make his case more aggressively. As a close friend of Noyes, whose health was on the decline, (he would die less than a year later) Millikan was infuriated with Pauling’s insensitivity to the circumstances. But this did not stop Pauling: within two weeks, after thinking the situation over, Pauling addressed Noyes directly by letter, claiming that he was considering leaving Caltech since the promised chairmanship had apparently been taken away. For his part, Noyes still wanted Pauling to succeed him as chair. 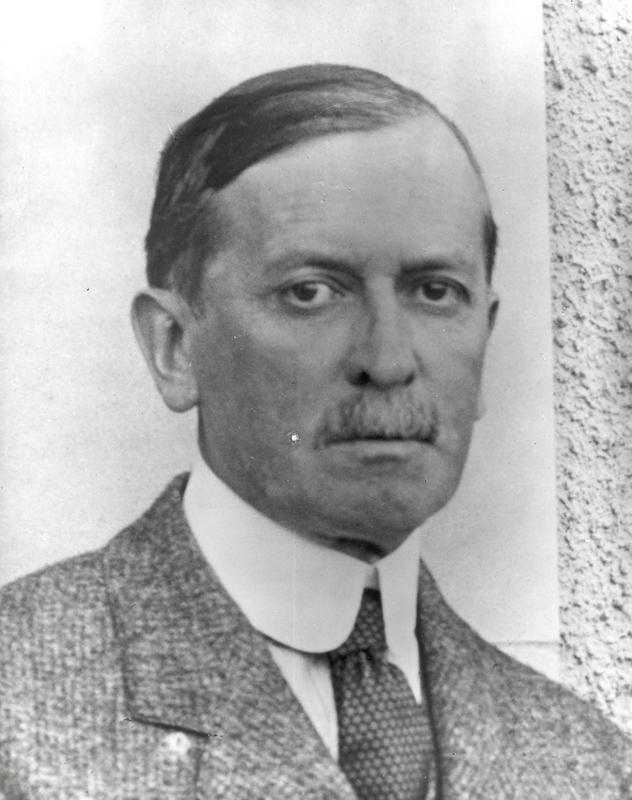 Upon receiving Pauling’s letter, Noyes passed it on to astronomer George Ellery Hale, who had been central to shaping Caltech into a prestigious institution over the previous two decades. Noyes also met in person with Hale, Millikan, and physicist Richard Tolman to discuss the question of his successor. Millikan favored Tolman for the position, in part because he was concerned that Pauling’s modest upbringing would impact his ability to engage with and woo wealthy donors. Noyes also admitted to harboring concerns about Pauling’s leadership style, the result of having observed him in the laboratory, where he was inclined to delegate specific tasks to his students and staff rather than allowing those under him to think through problems for themselves. Ultimately the four decided that the best course of action was to split the leadership of the division in half. Pauling would be anointed as chairman but would be asked to work with a new Chemistry Division Council, to be comprised of a selection of five of Pauling’s fellow faculty. The group also decided that Tolman would represent the division to the Caltech Executive Council and retain primary responsibility for interacting with donors. The creation of the Division Council, which was modeled on the Institute’s existing Executive Council, reflected the inclusive approach to running the division that Noyes had developed during his tenure and insured its institutionalization. In a letter requesting the Executive Committee to establish the Division Council, Noyes and Tolman described the duties of the chairman as being in a “spirit of cooperation” with the council, such that the chairman would bring matters before the council and make recommendations. A separate memo further clarified the roles to be played by the chairman and council, noting that the chairman would represent the division to the broader Caltech community, but with certain restrictions. Among them, the memo envisioned the council as having “final authority and responsibility” for making recommendations to the Executive Council concerning budgets and major expenditures, staffing and promotions, and decisions on the usage of laboratory space. The council was tasked with meeting every month during the academic year or when called by the division chair. personally decide all administrative questions, except that he will refer matters upon which a consensus of Division opinion is desirable to the Council or to the Committee of the Division, or to the Division as a whole, as indicated in the statement given below of their respective functions. The various restrictions outlined in the memo were unacceptable to Pauling, and he refused to sign off on its contents. Instead, he replied to the memo with a written rejoinder addressed to the Executive Council. In it, Pauling expressed his feeling that the Division Council approach would prove inefficient and stagnate the progress of the unit as a whole. “The more reactionary and less ambitious members of the group,” he worried, “will determine its policy, inasmuch as to move ahead is harder than to stand still.” More specifically, Pauling was concerned that the council would be ruled by those who were most out of touch with current trends in research and the instruction, and that the quality of the division would suffer accordingly. Hesitations about trying to work within this structure, compounded by the difficult financial times being endured nation-wide, were such that Pauling chose to the decline the chairmanship under the terms offered. I would not accept appointment as Chairman of the Division with authority vested in a Council, inasmuch as it would be impossible or difficult to build up the Division under these circumstances. With someone else as Chairman, I would not feel called on or justified in making any effort to build up the Division, this being then the responsibility of the Chairman. Professor Morgan says that there is no chance of building the West Wing of Gates for five years, no chance of increasing the Chemistry budget, no chance of getting new staff members, no chance that the Institute would promise an increase in budget at some definite time in the future. With no prospect of developing the Division, I would not accept its Chairmanship. Ignoring Pauling’s objections, the Executive Council approved the Division Council on November 2, 1935, the day after Pauling authored his letter. From that point, it would take more than two years to resolve the disagreement between Pauling and upper administration. Central to the healing process was Warren Weaver at the Rockefeller Foundation. In March 1936, Weaver informed Pauling of the Rockefeller Foundation’s interest in supporting “an attack on cancer from below (structure of carcinogenic substances, etc.) but not from above.” The following month, further details about the Foundation’s proposed level of support were shared at a Division Council meeting, where it was conveyed that the grant could fund research in organic chemistry at rate of $250,000 over five to seven years, with an additional $50,000 going to the Division of Biology. The Division of Chemistry and Chemical Engineering was asked to submit its grant application by August. Needless to say, a potential windfall of this magnitude served as a powerful motivator for the division to shift its attention toward biochemistry and also provided Pauling with significant leverage in his pursuit of the division’s chair. This leverage first began to manifest when Noyes put Pauling in charge of identifying three research fellows to attach to the grant. The previous year, Pauling had conducted a similar search and was unsuccessful. During this first attempt, Pauling had sent out letters to chemistry and medical departments at the University of Chicago, the University of Michigan, Columbia University, Washington University, and Harvard describing the ideal candidate as “original and energetic” but not requiring plum facilities to carry out effective research. This second time around, Caltech’s relative lack of facilities would be less of a problem. The potential Rockefeller grant was partly responsible for this, as was a plan to begin construction on the Crellin Laboratory the following year. [Ed Note: Over the past eleven years, one of the Pauling Blog’s areas of interest has been the exploration of different institutions with which Linus Pauling was affiliated. Posting series authored in support of this interest include examinations of Pauling’s time at The Center for the Study of Democratic Institutions, the University of California, San Diego, Stanford University, and the Linus Pauling Institute of Science and Medicine. Pauling is, of course, most famously associated with the California Institute of Technology, his institutional home from 1922-1963. But attempting to develop a series of blog posts that delve into his institutional relationship with Caltech is a daunting task — in addition to being there for a long time, a great deal happened during those forty-one years. Linus Pauling became Chairman of the Division of Chemistry and Chemical Engineering and Director of the Gates and Crellin Laboratories of Chemistry at the California Institute of Technology in 1937, succeeding long-time head A.A. Noyes. But before this time, he had taken on administrative responsibilities that would prepare him for the position and demonstrate to his superiors that he was a suitable candidate. By 1937, Pauling had also long since proven himself to be a world-class researcher and his rank had advanced accordingly: appointed Assistant Professor of Theoretical Chemistry in 1927, he was promoted to full professor just four years later. Importantly, Pauling’s research interests also led to the fostering of a strong working relationship with the Rockefeller Foundation during a key moment in institutional history. Pauling’s demonstration of administrative skill and his research achievements, in tandem with his valuable ties to the Rockefeller Foundation, all contributed to the viability of his candidacy for division chair in the post-Noyes era. From the very beginning of Pauling’s tenure as chair, the need for and allocation of space ranked high as an ever-present concern. Prior to his appointment as division head, Pauling had gained useful experience with the administration of space. A member of a 1929 sub-committee charged with exploring ways to improve graduate instruction and research in physical chemistry, Pauling found that space devoted to graduate research was a pressing need and advocated that the division act accordingly. Later, Pauling himself dealt with shortages in space when compelled to move his laboratory to the astrophysics building beginning in 1932. Once Pauling became chair, these problems continued to linger, if softened somewhat by the construction of two new facilities, the Crellin and Church Laboratories. The Gates Laboratory, circa 1930s. Credit: Caltech Archives. Pauling even went so far as to put forth a suggested floor plan: the sub-basement, basement, and first floor should be devoted to physical chemistry, he felt, and the second and third floors to organic. Pauling further suggested that, as the division continued to grow to the point of overcrowding, a new building devoted to organic chemistry could be built, leaving physical and inorganic chemistry to occupy all of Gates. And as it turned out, Pauling’s vision proved accurate: a new building did come very soon, with construction of the Crellin Laboratory of Chemistry first proposed in 1935 and completed in 1938, not long after Pauling took up the chairmanship. In the years prior to his taking charge, Pauling also developed a reputation as an advocate for his fellow faculty; a stance that sometimes put him at odds with the Institute’s upper administration. In 1932, Robert Millikan, a Nobel laureate who was then the Chairman of the Caltech Executive Council, asked that the faculty vote to take a 10% pay cut in response to the economic depression then gripping the United States. Pauling vocally opposed this request, noting that only the Institute’s Board of Trustees could take such an action. Three years later, Pauling voiced his support for raises that were pending for newly tenured colleagues Richard Badger and Don Yost, despite continuing budget woes. Pauling argued that the raises would help the division maintain its position as a leader within the profession by rewarding the successes of deserving researchers. As Pauling told Noyes, “I feel that in university administration, just is to be esteemed above expediency, and a satisfied staff above a balanced budget.” Pauling’s attention to faculty pay remained a hallmark of his tenure as chairman. Indeed, one of his final gestures as division leader, put forth in 1957, was a $1500 gift earmarked for Caltech faculty salaries. Another issue with which Pauling would grapple as chair was the imperative that the division be properly equipped, a problem that Pauling had encountered in his own research. 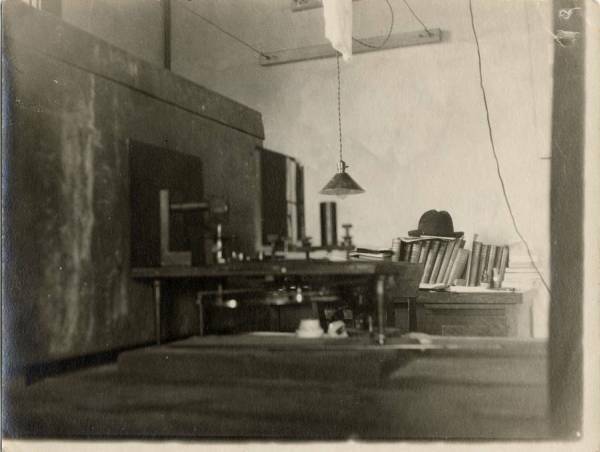 In 1930, Pauling spent part of his summer at Arnold Sommerfeld’s Institute for Theoretical Physics in Munich, and upon his return to Pasadena, he requested institutional support for an electron-diffraction apparatus that was similar to Sommerfeld’s. As with his advocacy of faculty raises, Pauling’s request was in keeping with his ambition that the division maintain a position of prominence, this time in crystal structure research. I should not like to have this laboratory, which has played a significant part in the development of crystal structure since the early days, fall far behind the other and newer crystal structure laboratories in this country. The most interesting experiments are the least safe – those which might give a surprising result, but which might fail. It is difficult to use these as an argument for buying new apparatus, inasmuch as success cannot be guaranteed. I feel nevertheless that these experiments are fully important as the routine ones. Over time, Pauling continued to exert influence on decision-making related to the divisions’s general equipment needs, and became a formal member of its Equipment Laboratory Committee in 1935. Without doubt, a major factor behind Pauling’s elevation to chairman was the strength of his relationship with the Rockefeller Foundation and, more specifically, its Director of the Natural Sciences, Warren Weaver. Pauling had been cultivating ties with the Foundation and Weaver for at least five years prior to his appointment as chair. In July 1932, he secured Rockefeller funding under what he later described as a “small grant” for $10,000 per year (nearly $170,000 in contemporary valuation) for crystal structure research. This grant was renewed twice and proved a crucial means of support during difficult economic times. After those three years had passed, Weaver told Pauling that the Foundation would no longer fund his current line of research, but that they would be interested in its biological applications. Rockefeller Foundation administrator Warren Weaver. As a result of these discussions, Pauling began redirecting his interests towards biological topics. In doing so, he requested $5,000 per year from Caltech’s Executive Council to supplement a potential $10,000 annual award from the Rockefeller Foundation, an amount that he ultimately received for three years beginning in 1935. Following the Foundation’s approval of his grant, Pauling wrote a thank you letter to Weaver in which he confided that he had already begun preliminary investigations on the structure of hemoglobin. Pauling added, “As I have read about the problems of biochemistry, I have become more and more enthusiastic about the possibilities of the application of our methods.” In short, he was smitten. For Weaver, Pauling was part of the Foundation’s larger project of promoting biochemical research across the United States and also a valuable resource in deciding how to carry it out. In particular, Weaver solicited the perspective of researchers like Pauling on how best to coordinate training across institutions. One particular case involved an Antioch College researcher named O.L. Inman. Inman had requested Rockefeller support for studies of chlorophyll that were similar to what Pauling had done with hemoglobin, with the proviso that he would only do so if he could bring in someone who had worked on hemoglobin in Pauling’s lab. When asked for his input, Pauling told Weaver that Inman’s idea was doomed to failure, since chlorophyll lacked paramagnetic atoms. Weaver promptly heeded this advice, thus halting one potential instance of cross-institutional training. In an undated note likely written in the mid-1940s, Pauling reflected on his relationship with the Rockefeller Foundation and the role that it played in influencing his research trajectory. “Perhaps,” Pauling wrote, “the remark from Weaver that my grant for molecular structure was all right, but that the main support was going in another direction, and the hint that application of m. s. [molecular structure] to biological problems might interest the Foundation greatly” had indeed made an impact on his decision-making. However, Pauling did not agree with the notion that Weaver’s encouragement had diverted him away from more focused attention on chemical subjects. 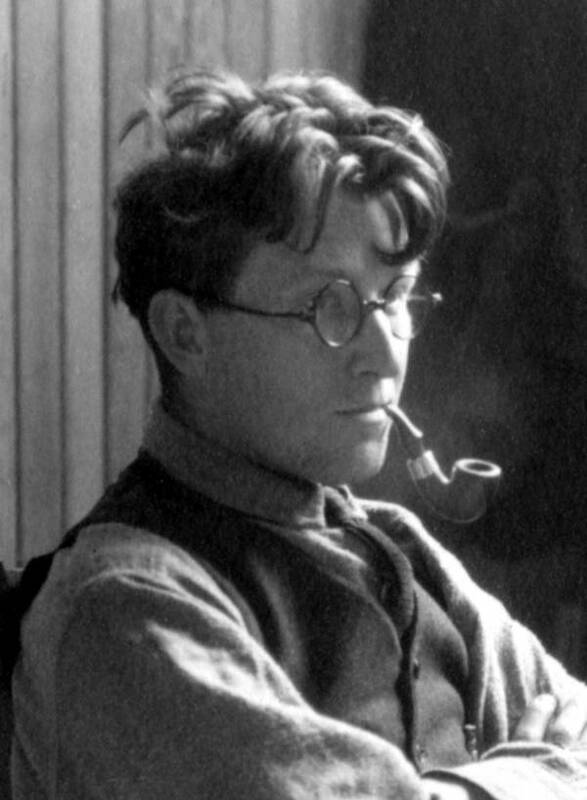 Rather, Weaver’s suggestion had opened up vital new territory of which Pauling had been unaware and that he subsequently became eager to explore. Pauling further described his relationship with the Rockefeller Foundation by likening it to a joke he had read in the Saturday Evening Post. A young man and young woman were saying goodnight at her door. She said ‘I’ll give you a kiss – I owe it to you for bringing me all the way out to 155th Street, and next week I’m going to move out to 242nd. Regardless of its impact on his research agenda, Pauling’s willingness to follow Weaver’s suggestions and the research funding strategies put forth by the Rockefeller Foundation would prove to be the tipping point in Pauling’s ascension to the chairmanship of the Division of Chemistry and Chemical Engineering at the California Institute of Technology. Red carnations left anonymously in the Valley Library Special Collections and Archives Research Center foyer on February 28, 2018 — Pauling’s 117th birthday. Tiah Edmunson-Morton: Do you see yourself as his biographer? Chris Petersen: Oh no, definitely not. But here is what I do see myself as. I see myself as a person who, through pure accident, wound up in a very unique position. I was hired as a student assistant in 1996, I was hired as a full-time [faculty member] in 1999, and that was the period of time during which the collection was being processed. And somehow I took charge of that when I was a student. The person who had my job before me left in the spring of my senior year of college, and at that point I began to lead the processing effort of this enormous collection. And that continued. We published the catalog in 2006, so that’s ten years of work based on my start date as a student. And that’s never going to happen again. Nobody’s ever going to re-process the Pauling Papers. I hope not, at least. [laughs] So I had this opportunity that nobody else will ever have. And when you work with a collection, you don’t necessarily become their biographer, but you do have a level of intimacy with the material that nobody else will ever have, because nobody else is going to process that collection. Linus Pauling in the original Special Collections reading room, 1988. And now when I think about the blog I think about it in multiple ways, but one of the ways that I think about it is it being a resource for future archivists who work at OSU to be able to work with this collection in a more effective way, just because they’re not going to have that same experience of working with it that I had. And part of what continues to motivate me to publish the [Pauling Blog] is that — to leave a little bit of my experience behind after I’m gone. Because the blog will hopefully continue to exist. I doubt it will continue to be published after I stop doing it, whenever that is, but what we’ve done will continue to exist. We’re archiving it with our Archive-It instance, so it’s in the Internet Archive. It gets archived once a quarter. And I’m happy about that. It’s a very big collection, it’s difficult to provide reference for it because of its size, and it’s unfair for all of the people who work here to be expected to know it on anything more than a surface level. So this is a tool for them to have in the future. TEM: Is there a post that you thought about writing, because of the depth of knowledge that you have about the collection, that you decided not to write? There’s a part of me that wants to write a reflection about my engagement with Pauling, a person I never met. He died when I was a senior in high school; actually the summer after my senior year of high school. I was working for the Department of Transportation picking up garbage by the side of the road in Eastern Oregon on the day that he died. So that was my status at the end of his life. But I have come to know him well through strange ways, and I have come to know his oldest son quite well – Linus Jr. – through oral history. And I was in the middle of this department [Special Collections] that doesn’t exist anymore, that was devoted to him. And that’s, again, a unique experience. Part of my oral history work, in addition to Linus Jr., was to interview Cliff Mead – basically the only head of Special Collections that ever existed – to try to get some of his memories from the chapter before I came along in ’96, because there were nine years of time that elapsed. So I could have a history of Special Collections recorded somewhere. And anyway, part of me has thought about writing these recollections down, but it seems like a lot of work [laughs] and I have other things to do right now. But maybe someday. Ava Helen Miller with Linus Pauling, 1922. TEM: What about topics that you’ve thought about writing about? I mean, there’s some really personal relationship stuff between he and Ava Helen. CP: Yep. That’s actually a good example of something that I’ve thought about and haven’t done. So they were separated for a year when he went to Caltech and she was here [at Oregon Agricultural College]. They wanted to get married and their parents wouldn’t let them, so she stayed here in Corvallis for a year and he went for his first year of grad school. And then he came back that next summer, they got married, and they went off together. But they were apart for one year and they wrote to each other basically every single day, and we have all of his letters but none of hers, because he burned them. And I think that there’s probably good stuff in those letters but I just can’t deal with it because there’s also a lot of lovey-dovey stuff, and there’s just a lot of stuff period. But I think that the correspondence between he and Ava Helen is ripe for mining, and Mina Carson did some of that for her Ava Helen biography. Pauling was super formal in his correspondence and pretty much to the point, because he was doing a lot of corresponding and just was a very busy person. The one time where he reveals himself on any deeper level, or reveals any kind of vulnerability, is in his correspondence with his wife. So I think that there’s probably a lot there that could be thought about and teased out, but it would take a lot of time and thinking to try and figure out what exactly is going on here with some of that stuff. But that’s something that I would like somebody to do some day; that’s definitely at least a paper, if not a book. Something that I would like somebody else to do that definitely is a book is to talk about his relationship with Caltech. He was there for a long time and it would be really interesting to trace his evolution while there and also to trace the Institute’s evolution while he was there, and think about how the two of them were symbiotic on some level. I mean, Caltech was not Caltech when he joined, and it is Caltech today in part because he was there. He helped to build that place. He certainly wasn’t the only person, but he was a significant piece of it. And on the same token, when he went to Caltech — he came from an extremely humble background and he’s lucky to have made it out of that background. When he went to Caltech he was very smart and ambitious but super green. I mean, his education that he got here was, I think, pretty modest. OAC was a land grant institution, it was focused on practical stuff, and he had far greater aspirations than that. Hand-tinted photo of Pauling at the Sutherlin work site, 1922. And he got into Caltech — one of my favorite stories about Pauling is that, so he’s been accepted to Caltech and the summer before he goes down there he’s working for the Department of Transportation and he’s a pavement inspector. And so he’s out in the middle of nowhere in Oregon, inspecting pavement and living in a tent. But before he embarked upon this job he wrote to A.A. Noyes, who is the head of the Chemistry section of Caltech — there are basically three people who started Caltech and Noyes was one of them — and Pauling says, “I’m coming to grad school, how do I become a grad student?” And Noyes is writing a textbook and he sends him a manuscript version of the textbook and tells him, “Do all the problems in this book.” And so that summer in his tent, with a lantern, Pauling is doing this work and learning how to become a grad student and how to become a scientist. And so he goes to Caltech and he’s there for a few years and at the end of that he gets this Guggenheim fellowship to go to Europe to learn quantum mechanics as it’s basically being invented. And then he comes back to the United States, applies quantum mechanics to structural chemistry, publishes a series of papers that become The Nature of the Chemical Bond in 1939, and that’s Nobel-quality work at that point. And it’s a very short period of time during which this process is moving forward, but for me it begins in that tent. In any case, Caltech was hugely important for Pauling and vice-versa, and I think that would be a book that somebody should write; I’d love to see that. That’s not a series of blog posts. One of the things that we’ve done a lot is to talk about his associations with places. We’ve done a series on his tenure at the Center for the Study of Democratic Institutions, which was rocky at best and short-lived. Same thing with UCSD. We’ve got a series coming out soon about his time at Stanford. We’ve done a lot on his relationship with Oregon Agricultural College too. But it’s harder to wrap yourself around the relationship with Caltech because he was there for so long and so much happened. But I think I figured out a way that we can start to engage with that a little bit, and that’s something that’s being worked on right now, and that’s to talk about his work as an administrator. So he was the head of the Division of Chemistry and Chemical Engineering for a long time and he was in charge of a lot of grant money and he had an army of grad students who worked for him. And part of his success story is that he was a very able administrator, and obviously a brilliant thinker. But he published 1,100 papers and you don’t do that without help. And there are plenty of co-authors there and people who went on to win Nobel Prizes — the Pauling tree is vast and significant. So I’m interested in that; I’m interested in his ability to be a leader of men. And it was men, because Caltech didn’t allow women. But I’m interested in his ability to attract grant money and how this all flows into creating this career that is so remarkable. And a lot of it happened at Caltech; a lot of the best stuff happened at Caltech. 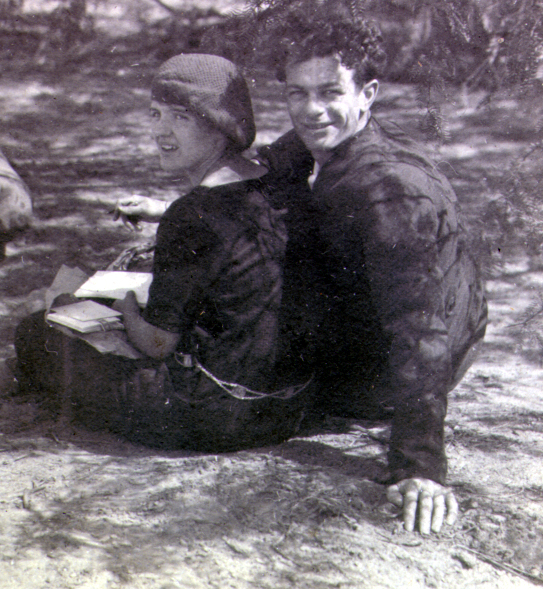 Ava Helen and Linus Pauling, 1924. 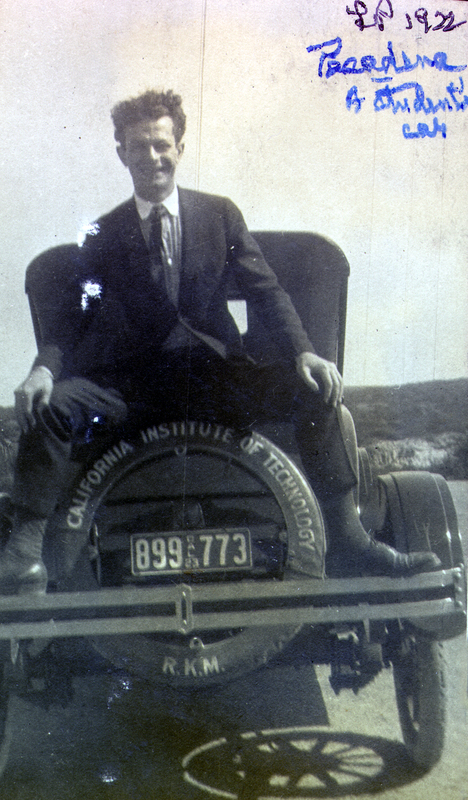 Pauling’s final year of graduate school at the California Institute of Technology, 1924-1925, was quite busy. During this last phase of his student experience, Pauling’s primary research interests centered on hematite, corundum, and beta-alumina, though a great deal more professional and personal growth can be traced to this time in the budding young scholar’s life. Together, Pauling and Hendricks worked on a theoretical paper that pieced together much of the work that they had completed over the previous year and a half. The paper was published in the Journal of the American Chemical Society (JACS) in March 1926 (nearly a year after Pauling had completed his PhD) and titled “The Prediction of the Relative Stabilities of Isosteric Isomeric Ions and Molecules.” The paper was a milestone in that it was Pauling’s first paper devoted solely to the subject of the chemical bond. It was not, however, the first paper that Hendricks and Pauling had co-authored. In 1925 the duo worked together to publish two sets of crystal structures: “The crystal structures of hematite and corundum” (March 1925) and “The crystal structures of sodium and potassium trinitrides and potassium cyanate, and the nature of the trinitride group” (December 1925). During his last year of grad school, Pauling also collaborated with his friend and former roommate, Paul Emmett, on an X-ray determination of the crystal structure of barite. Their article, which was published in JACS in April 1925, is another example of Pauling’s work that corrected previous published structures. On top of the research that he was doing on crystal structures, Pauling also toyed with an idea in which he applied the Debye-Hückel theory, which was used to determine the energy coefficient of ions in dilute solutions. When he learned of this work, A.A. Noyes invited Peter Debye, who was based in Switzerland, to visit Caltech, in part to have him discuss his theory with Pauling. And although Pauling never published his original idea, in July 1925 Debye and Pauling did co-author a different paper, “The Inter-Ionic Attraction Theory of Ionized Solutes. IV. The Influence of Variation of Dielectric Constant on the Limiting Law for Small Concentrations.” Appearing in JACS, the article was a contribution to a larger series published by the journal on the inter-ionic attraction theory of ionized solutes. Later on in his life, Pauling developed a reputation for staying on top of the latest findings and issuing an informed opinion on a wide range of scientific topics. This character trait was likely spurred by an experience that he had as a graduate student. Early on in his graduate career, one of Pauling’s more influential professors, Richard C. Tolman, posed to him a question about diamagnetism. Pauling responded that diamagnetism was just a general property of matter, a lackluster reply that made clear that Pauling had not stayed current with the literature. Tolman kept questioning Pauling for more specific details until Pauling finally answered, “I don’t know.” For this he was reprimanded by a Caltech post-doc who told him, “You are a graduate student now, and you’re supposed to know everything.” This was advice that Pauling took to heart and that made a big difference throughout his career in science. Nearing the end of his graduate school tenure, Pauling read G.L. Clark’s paper on uranyl nitrate hexahydrate and, as he went, he corrected it. This was a continuation of the critical reading habits that he had first developed at Oregon Agricultural College and had continued to hone by lantern light while working for the Oregon Highway Department the summer prior to his enrollment at Caltech. It was likewise a practice that he would continue throughout his career: closely reading papers and correcting errors, often by letting the author or publisher know what he had found. By this time, with Roscoe Dickinson away, Pauling had taken up some of his mentor’s responsibilities in the lab and, as with Sterling Hendricks, was serving as an ad hoc advisor to several students. Likewise, with Dickinson gone, Pauling began to develop his own techniques to aid in crystal structure determinations. A methodology that was quite different from the formal instruction that he had received, Pauling’s approach used atomic sizes and chemical behaviors to approximate reasonable structures for molecules. After determining these possible structures, Pauling then used X-ray data to eliminate unlikely possibilities and to isolate the best possible structure for a particular substance. As it turned out, this approach to scientific inquiry already had a name, the stochastic method, and Pauling ultimately put it to effective use across many different disciplines. Linus Jr. and Ava Helen, 1925. Pauling’s last year as a grad student also included big changes in his personal life. After marrying in the summer of 1923, Ava Helen Pauling moved to Pasadena with her husband and kept house while he finished his degree. In the early years of their marriage, these duties also routinely included helping “keep house” in the laboratory, particularly by recording data and taking notes. Pauling’s research notebooks from these years are full of her handwriting, even including one note reminding Linus that she loved him. In the midst of all his coursework and research, and as Pauling was wrapping up his last Winter term at Caltech, another big change came about when the Paulings’ first child, Linus Jr., was born on March 10, 1925. By this time, Ava Helen was mostly excused from laboratory duty and focused her energies primarily on raising her children (ultimately there would be four) thus creating an atmosphere at home in which Linus could be as productive as possible. Linus Pauling completed his PhD in chemistry in June 1925, tacking on minors in physics and mathematics as well. His dissertation, titled “The Determination with X-rays of the Structure of Crystals,” consisted of a compilation of articles that he had previously published with little more than new pagination connecting them together as a whole. The summer after graduation, A.A. Noyes helped Pauling to secure a research fellowship that would enable him to stay at CIT and complete a research study on complex fluorides. 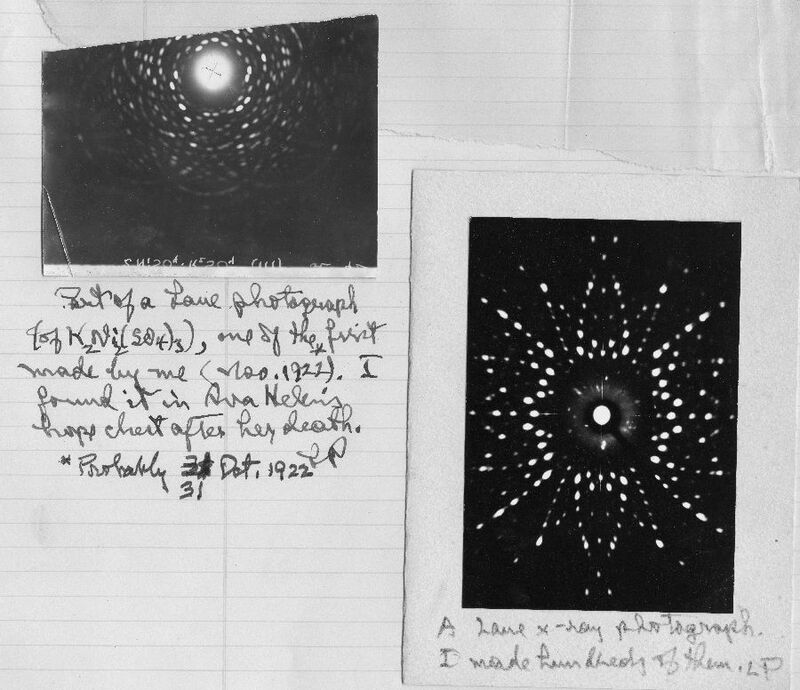 Pauling continued in this vein for the next eight months, during which time he began to make plans to leave Caltech to study as a post-doc at Berkeley, where he thought he might pursue a new set of experiments in G.N. Lewis’ lab, using funding from a National Research Fellowship that he had received. Not wanting to lose Pauling to Berkeley and Lewis, Noyes managed to arrange for Pauling to remain in Pasadena in order to complete additional unfinished work on crystal structures. Fortunately for Noyes, at the end of 1925, when the Guggenheim Fellowships were announced, Pauling was finally chosen for funding, having at last reached the program’s required minimum age. At Noyes’s urging, Pauling resigned from his National Research Fellowship once he had received the good news from the Guggenheim Foundation. From there, Linus and Ava Helen took an important trip to Europe and ultimately returned to Caltech, their institutional home for the next thirty-six years. As a graduate student at the California Institute of Technology (CIT), Linus Pauling tailored a research program that was focused on the properties of matter, with a particular emphasis placed on molecular structure. This interest and the techniques that he learned would shape Pauling’s scientific thinking for the rest of his life. Pauling’s focus on the theoretical, and his questioning of why processes move forward as they do or why structures are built as they are, was in keeping with contemporary trends in physical chemistry. 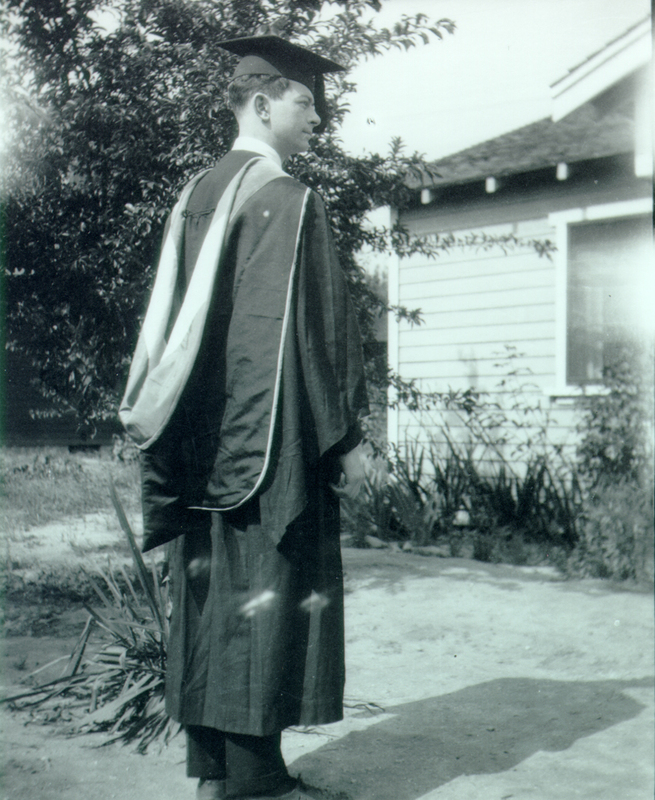 Pauling enrolled at Caltech with a strong desire to learn more about the discipline of physical chemistry and his early mentor, Caltech chemistry chair A.A. Noyes, encouraged him to build up his background in x-ray crystallography to further enable this pursuit. When Pauling began classes in September 1922, he also began his research in x-ray crystallography under the direction of his major professor, Roscoe Gilkey Dickinson. Not much older than Pauling and a recently minted PhD himself, Dickinson would soon become Pauling’s friend. Within weeks, Pauling began receiving invitations for dinners at the Dickinson house and was soon spending the odd weekend on camping trips with Dickinson and his wife. After Ava Helen and Linus were married, she too joined in these social gatherings. 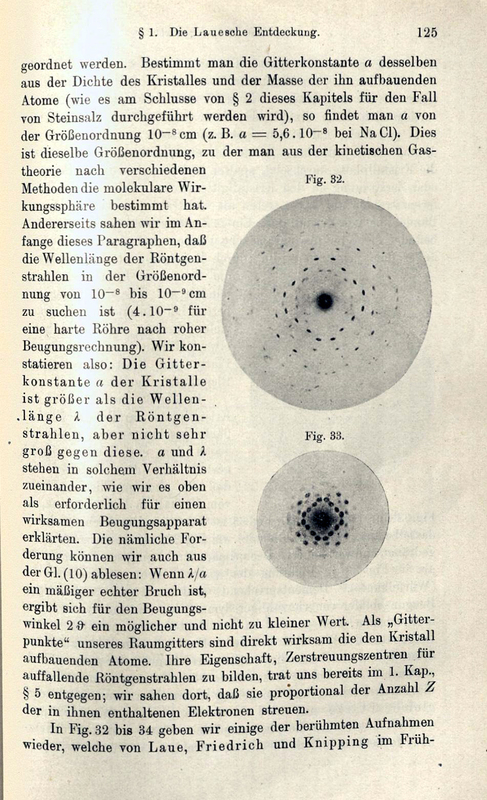 Fortunately the field of x-ray diffraction was in an excellent state in that the procedures were rather complicated but they were thoroughly logical, [and] consisted of a series of logical tests. …after about three years…I was making structure determinations of crystals that the technique was not powerful enough to handle, by guessing what the structure was and then testing it. X-ray apparatus at Linus Pauling’s desk, Gates Laboratory, California Institute of Technology. 1925. But in his earlier days, Pauling still needed some help. During November and December of his first year as a graduate student, Pauling prepared approximately twelve crystals and attempted to analyze them using x-rays, but none of the crystals yielded images sufficient enough to make a structure determination. At this point, Dickinson stepped in and directed Pauling to the mineral molybdenite (MoS2), in the process showing him how to take an adequate sample, mount it, and analyze it using x-ray crystallography. This assistance in hand, Pauling was able to determine the structure of the crystal and Dickinson returned to his own work, confident in his feeling that Pauling was capable of doing the crystallography himself. Soon after completing the experiment, Pauling was confronted by a very different type of confusion. With a successful structure determination in hand, he assumed that the next step would be to publish the work. So too did he assume that Dickinson would provide him with more direction, but he found that none was offered. As such, Pauling wrote up his findings and presented them for review to his major professor. Not long after, A.A. Noyes summoned Pauling to his office and carefully explained to the young graduate student that he had written up a paper with only his name on it and in the process had failed to acknowledge the crucial help that Dickinson had provided. Chagrined, Pauling revised the paper and listed himself as a second author, behind Dickinson. The experience proved to be an important one for Pauling, who was reminded early on of how easy it can be to minimize or discount the role that colleagues can play in one’s own research. By the end of April 1923, Dickinson and Pauling had submitted their paper on the structure of molybdenite to the Journal of the American Chemical Society (JACS); it was published in June of that same year. 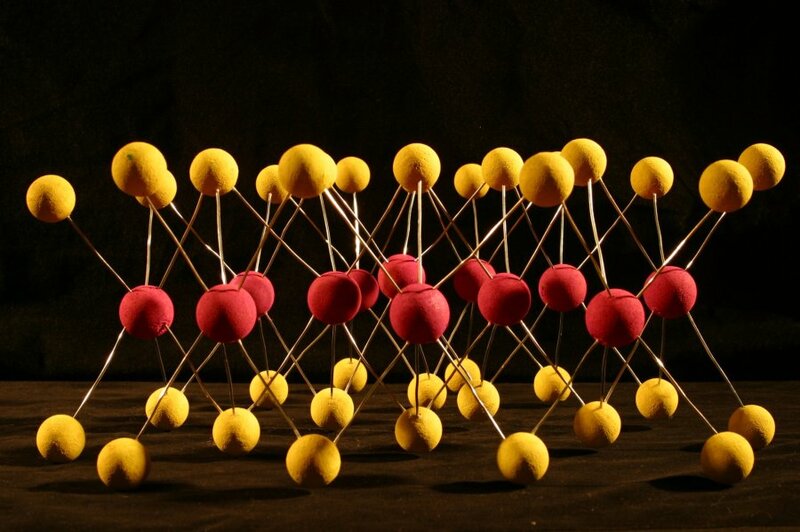 Together they had found the simplest crystal structure of molybdenite – which contains two molecules in a hexagonal unit – based on Laue and spectral photographs, and using the theory of space groups. Although he published a piece on the manufacture of cement in Oregon while he was in undergrad at Oregon Agricultural College, the molybdenite paper was Pauling’s first true scientific publication. Later that year, Pauling arrived at another milestone by publishing his first sole-author paper, one in which he described the structure of magnesium stannide (Mg2Sn) as determined, once again, by using x-rays. The paper was a huge accomplishment for another reason as well: the x-ray processes used by Pauling had never been successfully deployed for the study of an intermetallic compound before. And even though this was his first single author paper, Pauling still made sure to thank Roscoe Dickinson in his conclusion, taking pains to avoid another scholarly faux pas. He would continue in this practice throughout his graduate career. “The crystal structure of magnesium stannide,” was one of eight articles that Pauling published during his grad school years – he completed an impressive total of six structures before receiving his doctorate. Having authored these articles, Pauling found himself on the forefront of a shift in physical chemistry: as crystallography advanced, it was becoming increasingly clear that the properties of specific compounds were based on their structures, which could now be described with mounting confidence. Indeed, several of Pauling’s articles included reevaluations of existing structures, with revised explanations as to why the structures in question had not complied with the new data that Pauling collected. One such article was “The Entropy of Supercooled Liquids at the Absolute Zero,” which Pauling wrote with CIT faculty member Richard C. Tolman. In their paper, the two authors corrected an earlier claim made by Ermon D. Eastman, a professor of physical chemistry at Berkeley, who had stated that complicated crystals (those with large unit cells) have greater entropy at absolute zero than do simple crystals. Using statistical mechanical techniques, Pauling and Tolman were able to show that, at absolute zero, the entropy of all perfect crystals, even those with large unit cells, also has to be zero. Detail from ‘Atombau und Spektrallinien’ containing x-ray diffraction images. Pauling had become familiar with Tolman through a different means. During his third term at Caltech, Spring of 1923, Pauling took Tolman’s course in advanced thermodynamics, an experience that boosted his subsequent interest in quantum theory. It was also during this period that he read Arnold Sommerfeld’s Atombau und Spektrallinien (Atomic Structure and Spectral Lines) and began to be exposed to cutting edge research in quantum theory through the numerous physics and chemistry research colloquia hosted by Caltech. Sommerfeld would become a lasting influence on Pauling’s life and Pauling would eventually study with him in Germany while there on a Guggenheim Fellowship in 1926-27. 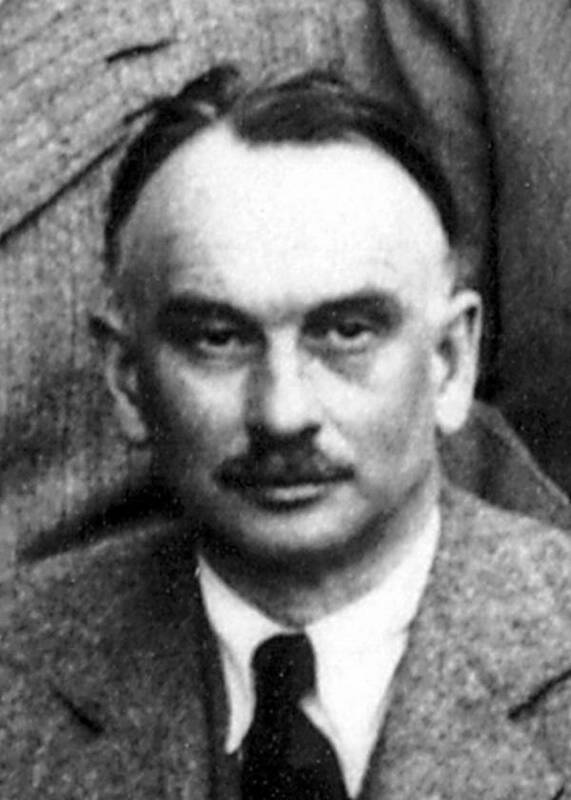 But well before then, in 1923, Sommerfeld visited CIT to talk about his work with the new quantum theory. As an aid to his lectures, Sommerfeld used crystal models that he brought from Germany, which he hoped would help him to better explain this complicated work. Afterward, Pauling felt emboldened enough to to show Sommerfeld some of the models that he himself had made in the course of his own research; models that turned out to be much better than those constructed by Sommerfeld. 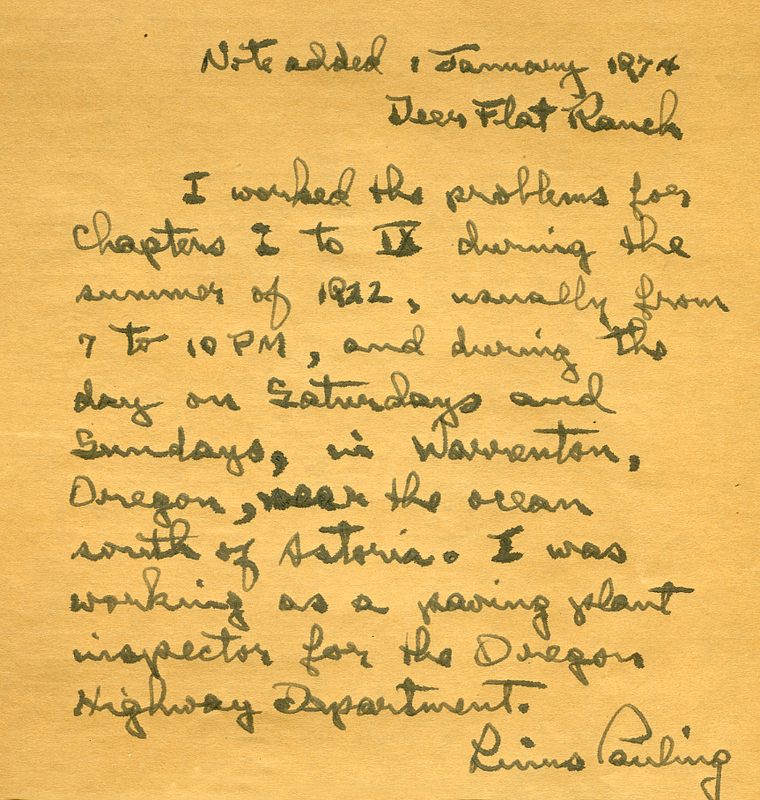 By all measures a successful chemical engineering undergraduate at Oregon Agricultural College, and wanting very much to continue his education and earn his PhD in chemistry, Linus Pauling wrote to several graduate programs across the country, inquiring in particular about fellowships. Though he had proven himself to be prodigious talent as a student and, already, as a teacher, Pauling’s location in Corvallis didn’t carry a great deal of cache with the country’s elite institutions. And given his family’s shaky financial health, some measure of institutional funding was going to be required if he were to advance in the academy. Pauling heard back from Harvard first, but was disappointed by their offer, which was for a half-time instructorship. Harvard also suggested that it would take him an estimated five years to complete his degree. A more promising option was the University of California, Berkeley, an institution that would continue to tempt Pauling in the years to come. But as soon as he received a favorable reply from the California Institute of Technology (CIT), he rescinded all other pending applications, including Berkeley. Pauling had a good feeling about Caltech, and indeed his choice would pay significant dividends for the next four decades. Once frustrated with chemistry at Oregon Agricultural College because he found it too easy, in graduate school Pauling was both presented with more challenging questions and received more considered guidance from some of the best scientists of the day. 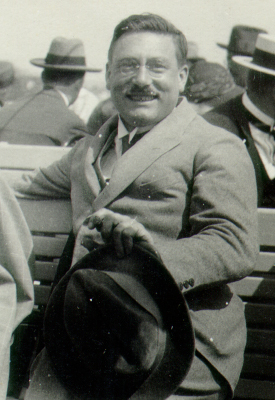 One such man was Arthur Amos Noyes, the chair of Caltech’s chemistry department who also served as Pauling’s contact throughout his application process. In their correspondence, Noyes encouraged Pauling to develop his coursework independently during his final quarters at OAC. Doing so would enable the bright but undertrained Pauling to enter CIT with the strongest background the he could muster in physical chemistry. Noyes’ suggestions included building up a solid understanding of both French and German, and also working through a more rigorous physical chemistry text than the one that Pauling was currently using in his class. This more appropriate text, An Advanced Course in Chemical Principles, was co-authored by Noyes himself, along with a Caltech colleague, Miles S. Sherrill. 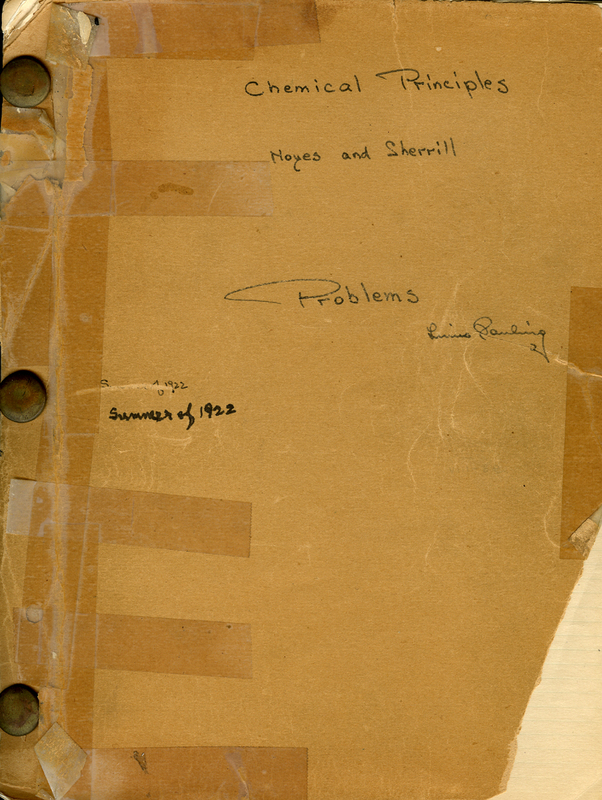 Noyes implored Pauling to move through the book, methodically solving all of its example problems, the end goal being to provide Pauling with a better understanding of the field, and to prepare him to pursue both advanced coursework at CIT as well as his own unique research agenda. The text itself was not merely descriptive, but also guided students through the problems that it presented by giving them the information necessary to solve them. This approach was unlike that taken by other popular texts at the time, which focused instead on leading students more directly to a solution. Noyes believed that his and Sherrill’s approach would help students to internalize what they were learning and assist them in understanding the processes required to arrive at the correct answer. Noyes’ specific suggestion was that Pauling work through the text in conjunction with the OAC physical chemistry class in which he was currently enrolled, beginning at a point in the book that matched where he was at in class. Instead, Pauling opted to commence with an independent study of the text during the summer after he graduated from OAC and before he enrolled at CIT. Doing so, he believed, would allow him to work through the problems systematically and would also help to occupy his time while he was working in the field, assisting with road construction and pavement testing for the Oregon Highway Department. Before he reached the Caltech campus during the third week of September 1922, Pauling had worked through the entirety of book, solving many of its problems by lantern light in his tent. And just as he would continue to do for the rest of his life, Pauling questioned the accuracy of certain answers posed by the authors of the book. Upon finally arriving in Pasadena that fall, a first order of business for Pauling was to compare his notes with those of Paul Emmett, his childhood friend and OAC classmate who had likewise entered a course of graduate study in chemistry at CIT. While Pauling was still at OAC, Noyes passed along a few more ideas that might help in preparing for the rigors of Caltech. In addition to his own physical chemistry book, Noyes also suggested that Pauling read X-Rays and Crystal Structure, authored by Sir William Henry Bragg and his son William Lawrence Bragg, and likewise advised that Pauling take a mineralogy class at OAC that would cover the fundamentals of x-ray crystallography. It is interesting to note that, while reading X-Rays and Crystal Structure (once again, put off until the summer of 1922), Pauling wrote to Emmett and told him that he was not learning much from it. The Braggs, of course, eventually became chief scientific competitors of Pauling’s, and the techniques that they described in their book proved fundamental to many of Pauling’s own early discoveries. As he tried to help Pauling secure funding for the coming school year, Noyes found himself questioning whether or not Pauling had the experience necessary to receive a teaching fellowship. Wanting to insure his study at CIT, Noyes encouraged Pauling to send further information that might help with finding a grant to cover tuition or even a graduate assistantship, which would promise a “somewhat larger payment.” Noyes assured Pauling that he assumed Pauling would eventually be qualified for a teaching fellowship the next year. In applying to graduate programs, Pauling expressed full confidence in his capacity to succeed as a student in physical chemistry, due to his strong grasp of mathematics, his previous experience teaching quantitative analysis and his work as a teaching assistant in general chemistry. But he also believed that the environment at Caltech was top-notch and would provide him with the training that he needed to carry out research, even though he had no prior experience in this area. Noyes ultimately was able to offer Pauling a prized graduate assistantship, confident in his interest in pursuing pure science and a career in university teaching. Pauling would foster a close relationship with Noyes over the years, and it was Noyes who worked hardest to keep Pauling at Caltech after he had completed his PhD, warding off the advances of G.N. Lewis at Berkeley in particular. 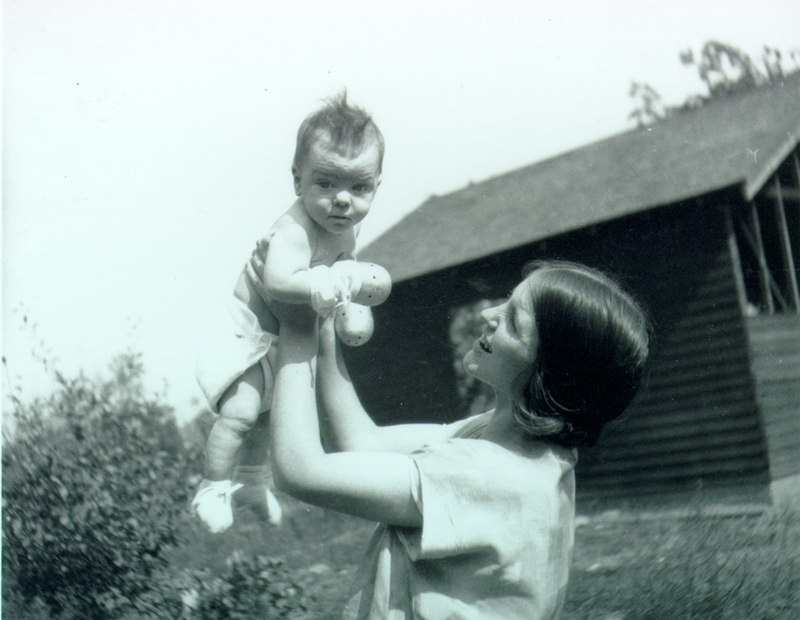 Paul Emmett with his mother, ca. 1920s. 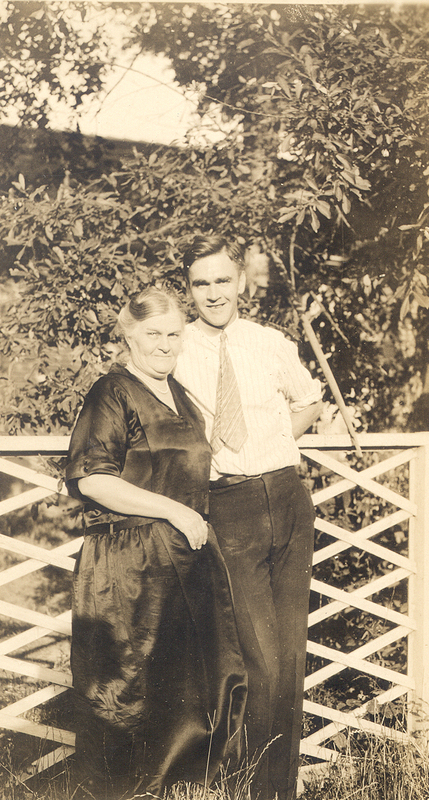 Pauling moved in with Paul Emmett and Paul’s mother in September 1922, and stayed with them for his first school year in Pasadena. During this time, Emmett and Pauling shared the same bed, sleeping in shifts. Pauling’s habits were such that he would stay up late studying while Emmett slept, and around 3:00 AM Emmett would get up to go to the lab, at which time Pauling then went to sleep. During this first year in California, Pauling also took Richard Chace Tolman’s class, Introduction to Mathematical Physics, which helped cement Pauling’s desire to become a theoretical physical chemist. 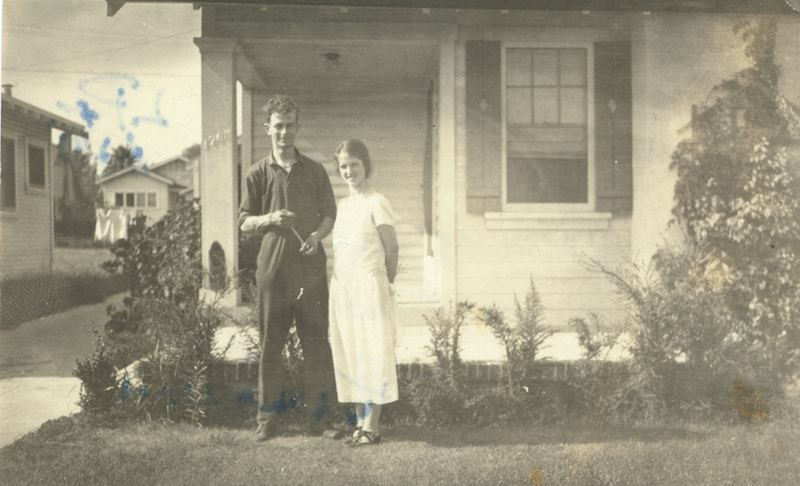 During his sparse free time, Pauling wrote letter after letter to his girlfriend, Ava Helen Miller, who remained in Corvallis to continue work on her Home Economics degree at OAC. Having expressed a desire to marry at least twice before Linus left for California, only to be rebuffed by their families, the two decided in their letters that they would absolutely be wed once Pauling had finished his first year of classes and just prior to his resumption of more construction work during the summer. Their plan came to fruition in Salem, Oregon on June 17, 1923, and Ava Helen moved to Pasadena that fall to accompany her new husband during his second year as a graduate student.